The advantages of Open Source Software. Hungary’s public administrations will by default use open document standards for their electronic documents, as of April this year, the government ministers agreed on 23 December, and all public organisations are encouraged to move to open source office tools. Hungary’s government also in December decided to cancel the funding of proprietary office suite licences for all schools. What would make this even better would be to continue funding schools making the transition so they can better support their free software infrastructure. This would also help incentivize schools to make the switch. Android is one of the most free prisons of this day and age. I’m interested and will keep my eye on Tizen, but as of September 2011 I don’t see any published licensing information (other than Linux’s GPLv2). On good faith, I don’t think this will be an issue upon first release. However, is Tizen going to evolve as “open” like Android or pursue some street cred with those who value free software? Even if a tease, I certainly applaud the idea of an API for “HTML5 and other web standards”. For various popular phone operating systems of the day, these “App Stores” are an ugly regression. Jobs had two stated reasons for the shift. He said Flash was a crash-prone resource hog and that it wasn’t an open standard. To a large extent, the first point is a consequence of the second. Because Flash is proprietary software developed by Adobe, third parties like Apple don’t have access to the source code or permission to change it. That means they can’t fix bugs or to optimize the code for particular devices. They have to rely on Adobe to do these things in a timely manner. His Holiness Steve Jobs wants access and permission but doesn’t want his customers to have it. Despite the FUD, there isn’t a benefit beyond Apple’s bottom line in denying users this freedom. Communities are more than capable of protecting themselves from software vulnerabilities and can build stable systems; our track record speaks for itself. Jobs can’t claim otherwise, given that key parts of Apple’s software spring from software freedom. Canonical (for obvious reasons) continues to celebrate proprietary games made available to Ubuntu users through their Software Centre. I’m not entirely against proprietary games for GNU/Linux, though I won’t install/buy this title given its licensing structure. OilRush is based on the proprietary Unigine. I think a better balance with free software would be to license the game’s engine freely and distribute/sell the data sets under non-free licenses. Though that would irk Free Culture supporters, they’re irked either way. A free software engine can be an incredibly useful contribution to computer science and other software that puts the engine to use. Exceedingly restrictive licensing for GNU/Linux games however, appears to be an inevitable trend in the short-run. An optimistic view sees software companies planning their long-run under the assumption that freer software licensing will offer a competitive edge and maintain profitable opportunities. If this were to happen, it may prove the OilRush model isn’t sustainable. New to DuckDuckGo, I’m discovering some of its impressive features. One I find useful is the bang searching feature. Using a bang (!) in one’s search, you can access other search services by forwarding your search to them. For example, if one wants to use Google services like Search, Image Search, or Youtube, one can use !g, !i, and !yt, respectively. I also noticed that !g takes you to Google’s Secure Sockets Layer (SSL) engine. It’s good to see Google and DDG offering options for users to help protect themselves against packet analyzers. Such tools should be standard in a free society. I started hearing about DuckDuckGo a few months ago but until today, I never made time to see what it’s about. I followed this explanation of bubbling which details search engines returning biased results, driven by user behavior. The variety of different results connected to political issues for example, is disturbing. 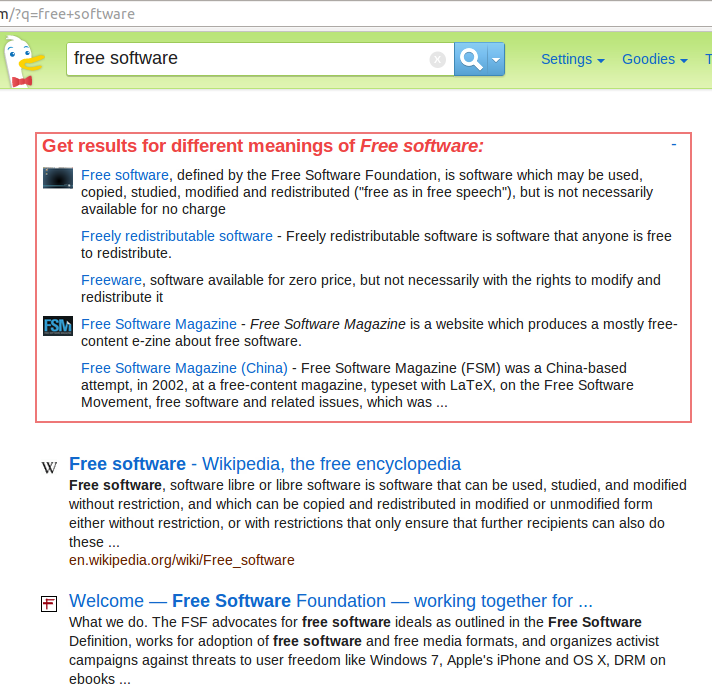 I thought I’d do a search for “free software” as I’ve always been a bit annoyed by the often pathetic results that rank high. The first image below was returned by Google. 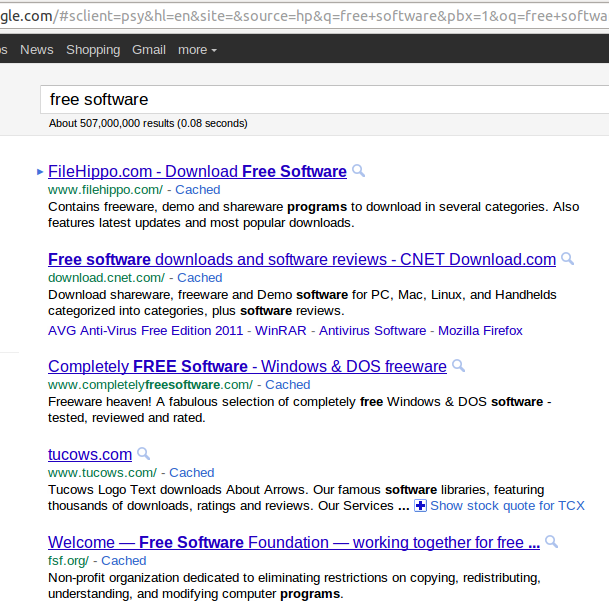 The first few results assume “free” to mean gratis and immediately you’re directed to mostly proprietary software offerings. The second image is from DuckDuckGo. Click them to enlarge. I was already sold at that point, but this may have been the nail in my Google Search coffin. It’s still early, but I’ve made DDG the default engine on my browser search and address bars. I’m not sure I’m going back to Google search.